This tutorial builds on what you learned in the previous data import and exploration tutorial by adding more steps and functions that broaden your experience with RevoScaleR functions. As before, you'll work with airline sample data to complete the steps. This tutorial focuses on analysis and predictions. R Client and Machine Learning Server are interchangeable in terms of RevoScaleR as long as data fits into memory and processing is single-threaded. If datasets exceed memory, we recommend pushing the compute context to Machine Learning Server. To complete this tutorial as written, use an R console application. You must also have data to work with. The previous tutorial, Data import and exploration, explains functions and usage scenarios. This section of the tutorial demonstrates several approaches for fitting a model to the sample data. If you are using categorical data in your regression, you can use the cube argument. If cube is set to TRUE and the first term of the regression is categorical (a factor or an interaction of factors), the regression is done using a partitioned inverse, which may be faster and use less memory than standard regression computation. Averages/counts of the category "bins" can be computed in addition to standard regression results. The intercept will also be automatically dropped so that each category level will now have an estimated coefficient. If cube is set to TRUE and the first term is not categorical, you get an error message. The coefficient estimates are the mean arrival delay for each day of the week. When the cube argument is set to TRUE and the model has only one term as an independent variable, the "countDF" component of the results object also contains category means. This data frame can be extracted using the rxResultsDF function, and is particularly convenient for plotting. We can run a more complex model examining the dependency of arrival delay on both day of week and the departure time. We’ll estimate the model using the F expression to have the CRSDepTime variable interpreted as a categorical or factor variable. F() is not an R function, although it looks like one when used inside RevoScaleR formulas. An F expression tells RevoScaleR to create a factor by creating one level for each integer in the range (floor(min(x)), floor(max(x))) and binning all the observations into the resulting set of levels. You can look up the rxFormula for more information. 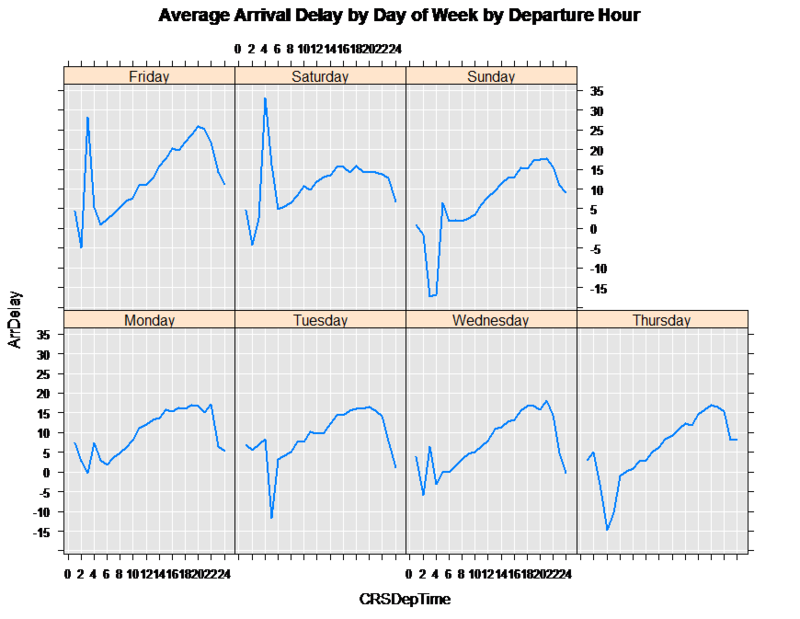 By interacting DayOfWeek with F(CRSDepTime) we are creating a dummy variable for every combination of departure hour and day of the week. The output shows the first fifteen rows of the counts data frame. The variable CRSDepTime gives the hour of the departure time and ArrDelay shows the average departure delay for that hour for that day of week. Counts gives the number of observations that contain that combination of day of week and departure hour. You will see that the new data set has only two variables and has dropped from 600,000 to 148,526 observations. 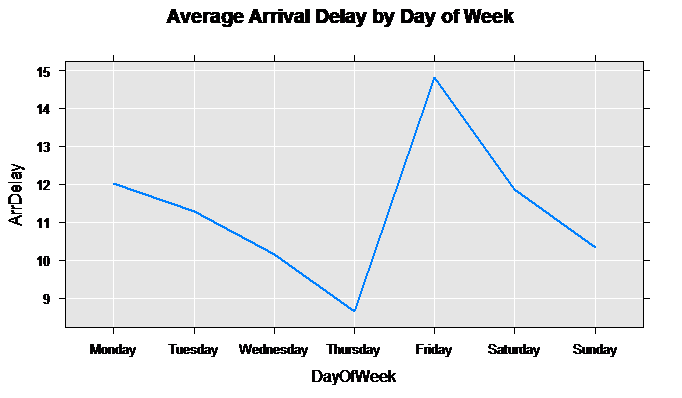 Compute a crosstab showing the mean arrival delay by day of week. The function rxLogit takes a binary dependent variable. Here we will use the variable Late, which is TRUE (or 1) if the plane was more than 15 minutes late arriving. For dependent variables we will use the DepHour, the departure hour, and Night, indicating whether or not the flight departed at night. You can use the object returned from the call to rxLogit in the previous section to compute predicted values. In addition to the model object, we specify the data set on which to compute the predicted values and the data set in which to put the newly computed predicted values. In the call below, we use the same dataset for both. In general, the data set on which to compute the predicted values must be similar to the original data set used to estimate the model in the following ways; it should have the same variable names and types, and factor variables must have the same levels in the same order. This tutorial demonstrated how to use several important functions, but on a small data set. Next up are additional tutorials that explore RevoScaleR with bigger data sets, and customization approaches if built-in functions are not quite enough. Another way to learn about ScaleR is through demo scripts. Scripts provided in your Machine Learning Server installation contain code that's very similar to what you see in this tutorial. You can highlight portions of the script, right-click Execute in Interactive to run the script in RTVS.